At 1:40 p.m. on December 17, 1944, Lieutenant John Brodka left Martha’s Vineyard Auxiliary Naval Air Station in Massachusetts bound for Charlestown Auxiliary Naval Air Station in Rhode Island. 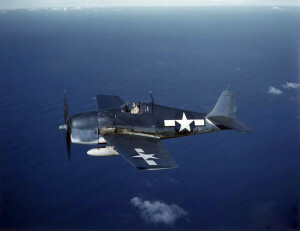 He was piloting an F6F Hellcat, (Bu. No. 41380). Twenty minutes into his flight, while passing over the town of Westport, Massachusetts, the engine began to miss fire and the plane began losing altitude. Forced to make an emergency landing, Brodka picked out a open field. As he was making his approach the engine suddenly lost all power and stopped which caused the plane to settle faster than anticipated, which put it on a collision course with a wooded area just ahead of the field. All the while the pilot continued to try restarting the engine. Just before he was about to crash into the trees, the engine started and ran for three or four seconds before stopping again, but it was enough to carry the plane over the trees and into the field. The field was muddy which affected the brakes. The aircraft crashed through a fence, crossed a road, and struck a telephone pole and went into a roadside ditch. Despite extensive damage to the plane, Lieutenant Brodka was not hurt. Lt. Brodka was assigned to VF-52.